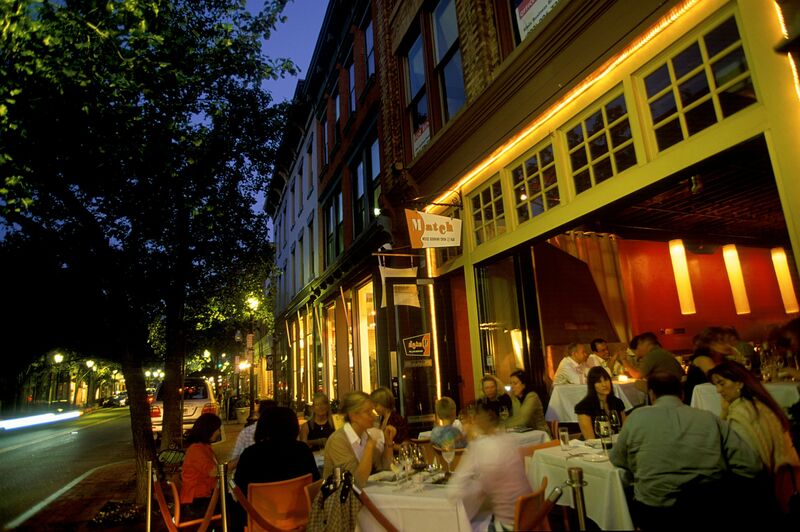 The surprising state of Connecticut provides the entire Northeast with weekends full of New England charm, waterside restaurants, parks, mountain trails, museums and crafts shopping. But families can plan a week-long excursion or a road trip to see even more. 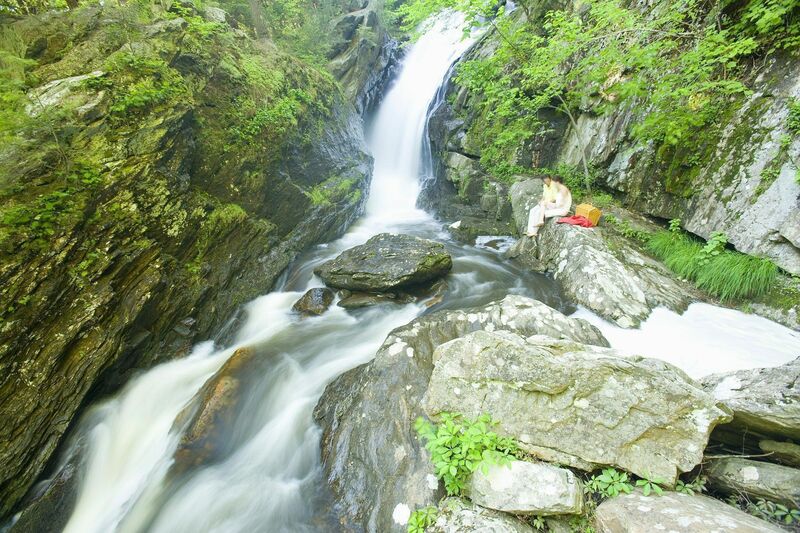 An easy drive from New York, New Jersey, Massachusetts, and eastern Pennsylvania, Connecticut is separated into five distinct regions where landscapes range from the sea to the mountains, and from country villages to skyscraper-filled cities. Read on for popular and lesser-known attractions, organized according to their location in the state’s regions. Although our guide focuses on summer travel, most of these attractions are open for a holiday all year round. For more information on activities, accommodations, or dining in Connecticut, search VisitConnecticut or CTVisit for ideas. Take a break from driving or touring and let out the family’s energy at SportsCenter of Connecticut. This covered and weather-protected facility offers a golf practice range, 18-hole miniature golf course, baseball and softball batting cages, laser tag arena, bowling, and the world’s only double-decker NHL-sized ice arena. The center is conveniently located off the Merritt Pkwy (Route 15) and is open 365 days a year. Public and private lessons are offered. Prices vary per sport and group. For a history lesson by the sea, take a ferry ride to Sheffield Island, where you can tour the Norwalk Lighthouse, lounge on beaches and piers, and look for birds and animals in the island’s wildlife refuge. The New England-style lighthouse, built in 1868, is 44-feet tall and surrounded by grassy park areas that would be perfect for a family picnic. Children and family summer camps are offered through August and include nautical adventure sessions, nature photography classes, and bird-watching programs. Sheffield Island can be reached by ferry from Norwalk. A tour of the lighthouse is included in the trip. If you’re in southwestern Connecticut, make a stop in Greenwich, where the beautiful mansions and seaside restaurants and parks will take your family’s breath away. Have a bite to eat at Gofer Ice Cream, a Fairfield County native. Greenwich has continuously been rated one of the best places to live in the U.S., and its marina charm will satisfy every family member. Visit the Bruce Museum, a fine arts and natural science museum that houses approximately 15,000 objects in fine and decorative art, natural history and anthropology, as well as a museum gift shop. Free for children under 5; open daily except Monday. The Connecticut Science Center contains five levels of 150 hands-on exhibits, a state-of-the-art 3D digital theater, four educational labs, plus daily programs and events that will keep adults and children of all ages occupied for at least the whole afternoon. The “green” museum (95% of the steel used for the Science Center is manufactured from recycled cars) promotes hands-on learning and allows visitors to examine the moon’s ancient craters up close, compete in experiments to see who can keep their motion designs flying longer, play “energy watt” pinball, or take part in the process of developing new products and substances with real scientists from Connecticut. Among tons of other activities, 3D movies are shown every hour and food can be purchased in the museum’s café. Nearby attractions include Kid City Children’s Museum, Dinosaur State Park, New British Museum of American Art, and Bushnell Park and Carousel. Museum admission is free for children 2 and under. Open daily except Monday until summer, when the museum opens every day, with last entry at 4pm. Originally a copper mining site, Old New-Gate Prison and Copper Mine was the first state prison in America and was used for housing serious criminals in the 1700s and Loyalists in the Revolutionary War. Newgate ceased operating as a prison in 1827 and became a National Historic Landmark and one of the most visited tourist attractions in Connecticut. Visitors can tour the prison walls where criminals of burglary, adultery, assault, and counterfeiting used to spend their time. You can also tour the underground cells, where air temperatures are always in the 50s. The visitor center contains a gift shop. Nearby Peak Mountain offers a bird’s eye view of Old Newgate Prison from the Metacomet Trail. The museum is currently closed for restoration, but its regular visiting season usually begins in May. Admission is free for children under 6. Visit the home of Samuel Clemens, a.k.a. Mark Twain, who lived in Hartford from 1874 to 1891 in his historically-recognized home where he created the legendary characters of Huckleberry Finn and Tom Sawyer. Twain’s home combines cultures and styles from Northern Africa, the Far East, and India, and new technologies were also introduced here, including a gravity flow heat system, split flues to allow for windows over two fireplaces, and seven bathrooms with flush toilets. In addition, Twain took pride in his telephone, one of the very first installed in a private home. 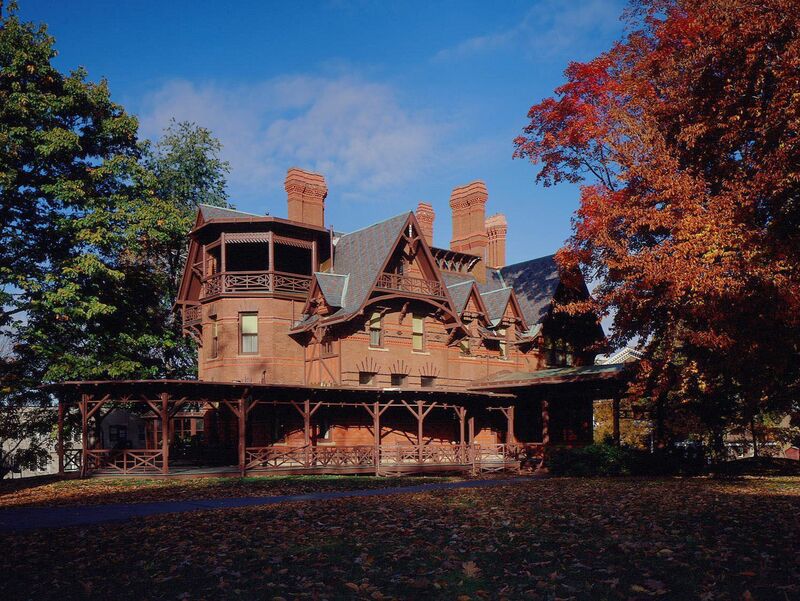 Twain’s home is considered a modern American landmark that any literature fan, no matter the age, should visit. The museum is $10 for children 6-16 and $16 for adults 17-64. Free for children under 6. 2011 Hours: Mon-Sat 9:30am-5:30pm, Sunday 12-5:30pm. Closed Tuesdays in Jan-March. One of the state’s richest cultural areas, south central Connecticut is home to Yale University and many fine museums. It’s also reputed to be the birthplace of pizza in America. Learn more about its attractions for families with kids of any age (but especially teens!) by reading the Family Travel Forum guide to New Haven With Students In Tow. 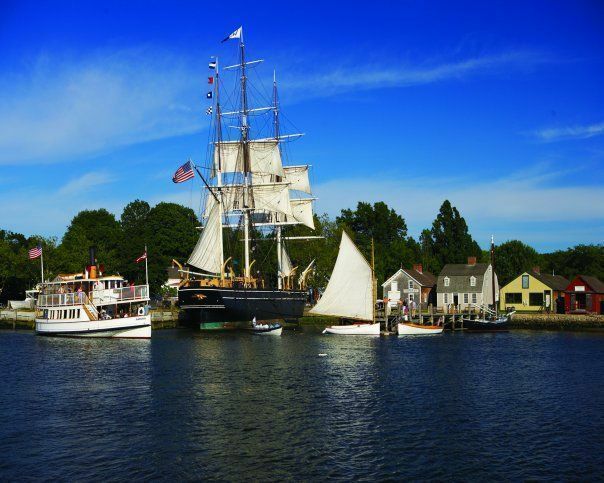 For over 75 years, one of Mystic’s main attractions has been the Mystic Seaport Museum of America and the Sea, which is divided into four main sections: 19th Century Village, Waterfront, Preservation Shipyard, and Exhibits and Galleries. The 19th Century Village features a re-created village with horse and carriage rides, lighthouse, lobstering exhibit, and many other old structures. On the Waterfront, check out all of the old ships and vessels, including the world’s last wooden ship, the Charles W. Morgan, and other boats including an oyster sloop and a sandbagger. The Preservation Shipyard allows you to view the process of building ships, from the paint and metalworking shop to the documentation and lumberyard. Be sure to stop by Treworgy Planetarium where you can learn about the night sky, or take part in one of their many programs. 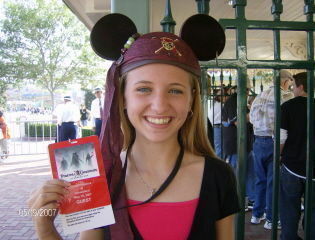 Admission for 2011: Adults $24; Youth (6-17) $15; Seniors, Active Military and Students $22; Kids under 5 are free. The Mystic Aquarium & Institute for Exploration features many exciting exhibits, allowing you to get close to the animals, as close as nose-to-beak to the penguins, or uncover fossils that are over 600 million years old. Go for an adventure-packed ride on the XD Motion Theater where you can explore the Challenge of the Deep, learning THE deepest, darkest secrets of the ocean. Watch the penguins being fed, or go to the Sea Lion show, where you can watch Coco, Surfer, and Boomerang, the stars of the show, as they perform live in the 1,200-seat Marine Theater. Another great exhibit is the Discovery Lab, where kids can actually get their hands wet and interact with the animals. Make-your-own, soft, hard, gelato, Connecticut-made, even Rhode Island-made, whatever you prefer the Connecticut Ice Cream Trail has it all. Driving through eastern Connecticut you will find yourself along the ice cream trail, with stops on the shoreline, inland, and even in those hard to find places in the country. Shops along the trail include Ed’s Kitchen & Creamery in Uncasville, Mystic Sweets & Ice Cream Shop in Groton, and Canterbury Cones in Canterbury. For information on lodging in the region, call the Eastern Regional Tourism District at 800/TO-ENJOY. Climb aboard the Essex Steam Train where you will be carted around on two coal-fired trains in restored railroad cars. You can choose between a combo trip of a Steam Train ride and a Riverboat tour, which is 2.5hrs, or you can opt for just the Steam Train ride, which is a 1 hour trip. Either way, you will undoubtedly witness a gorgeous country landscape and views of the Connecticut River aboard this nostalgic blast from the past. If you opt for the combo you will get to take a ride on the Connecticut River and learn the history of the river. This is a year-round attraction, and it incorporates the different seasons into the ride with a Santa Claus special during the winter, a view of the fall foliage, an up-close look at the spring flowers, and a nice shaded trip during the summer with the ocean breeze cooling passengers. A great option for families is the Family Fare package (2 adults, up to 6 kids) with a train and riverboat ride for $80, or just a train ride at a price of $50. This half-mile long beach in New London boasts many fun activities to keep the whole family entertained as they spend a day at the beach. From miniature golfing, waterslides, and swimming to a stroll down the boardwalk, there is so much to do. There are amusement rides for all ages, an arcade with everyone’s favorite classic game, skee-ball, among others, and a picnic and playground area. Take the whole family to Beach Blanket Movie Night for only $5 and enjoy a movie as you lounge on the beach. Check out their website for a list of other fun events offered throughout the season. Admission to the park varies depending on the day you visit and includes parking costs as well. Rates range from $0-$18/per car. Open May-September. The Submarine Force Museum is located on the Thames River, and is home to the world’s first nuclear-powered submarine, the USS Nautilus, which invites visitors to board the submarine and get a feel for what life is like aboard the sub for the sailors. The Museum is unique in that it is the only museum operated by the U.S. Navy and includes over 33,000 artifacts, 20,000 documents and 30,000 photographs. After being retired in 1980, the USS Nautilus returned to Groton, where it was christened back in 1954 by First Lady Mamie Eisenhower. Closed on Tues. Admission and parking are free. There are times when the museum is open, but the submarine is closed, so call ahead to check for submarine closure days. A classic part of the state, one of our favorite family attractions is located here: the Lake Compounce Amusement Park. To learn more about it and other attractions in this region, please visit FTF’s Guide to Lake Compounce and Northwest Connecticut.